Puff pastry is a classic ingredient for fancy-looking desserts or appetizers but it’s also a knight in shining armor when it comes to quick and easy to prepare finger foods. Using premade puff pastry sheets leads to sure-fire success and making your own puff pastry might seem out of the question, but if the taste can’t convince you—allow us as we share how and why to make puff pastry at home, plus 20 sweet and savory recipes. Homemade or store-bought puff pastry? When compared to buying a package of frozen puff pastry from the supermarket, making it from scratch can seem like both a fun weekend project and a frustrating and labor-intensive experience—as one can imagine. So, is it really worth making yourself? When it comes to the taste, the answer is a definite yes. Homemade puff pastry is made with lots of butter, while store-bought puff pastry often contains margarine or vegetable shortening—resulting in a less rich flavor and drier texture. However, if you’re running low on time or don’t have the patience, store-bought puff pastry is a pretty good substitute every once in a while. The basic recipe for puff pastry is actually pretty simple: 4 cups (500 g) flour, 4 ½ sticks (500 g) butter, 1 ½ cups (350 ml) cold water, and a pinch of salt. Start off by mixing the flour and the salt, then slowly pour in the water and combine. When the dough comes together, cover it with plastic wrap, and put it in the fridge for approx. 30 mins. before attempting to roll it out. Now for the interesting part: Put the butter in-between two pieces of parchment paper and soften it using a rolling pin. When butter is pliable but still cold, fold it into thirds, and roll it out again. Keep repeat until it’s about the size of a postcard. Then, lightly flour a working surface and roll the chilled dough into a circle. Put the rolled, cold butter in the center and fold both the right and left sides over to meet in the center. Then fold the bottom up and the top down to meet in the center. After that, roll out the dough into a long rectangle. Repeat this rolling and folding process at least six times—creating many thin layers of butter and dough. When baked, the steam from the melting butter will cause the layers to puff up into the crispy, flaky pastry we all know and love. Why puff pastry needs to be cold? For the best results, allow the pastry to chill for approx. 30 min. after every folding and rolling step. It’s quite time-consuming but also crucial for the whole process; if the butter gets too warm, it will be absorbed into the dough layers and won’t puff properly when baked. Feeling overwhelmed? Don’t worry! If you aren’t up for a whole-day, puff pastry-making project, shorten your preparation with this shortcut puff pastry. Whether you decide to use homemade or store-bought puff pastry, there are a few things to pay attention to. Don’t forget to flour both your working surface and rolling pin, as this will keep your puff pastry easy to work with. Why do you have to brush puff pastry with egg wash? Brushing your pastry with egg wash, a whole beaten egg, or a beaten egg yolk will help put color and shine on your crust. While the protein promotes browning, the fat in the egg yolk gives a nice, glossy shine to the baked puff pastry goods. Make sure only to brush the top of the dough—if you brush the edges, the layers will stick together and the pastry won't rise properly when baked. Why should you pierce your puff pastry? Piercing your dough with a fork allows some of the steam to escape during baking. This will help your pastry to remain flat and even, while still puffing up perfectly. Fresh, raw puff pastry (either homemade or store-bought) can be stored in the refrigerator for 2 to 3 days, or frozen for up to 1 month. Be sure it is sealed tightly in plastic wrap! Baked pastry, especially when it’s filled, doesn’t refrigerate well, and is best enjoyed the day of, or one day after, baking. Now that we all know how to make and properly use puff pastry, let’s talk about how to transform it into delicious sweet and savory recipes that span can take you from an early breakfast through to a late-night dessert. 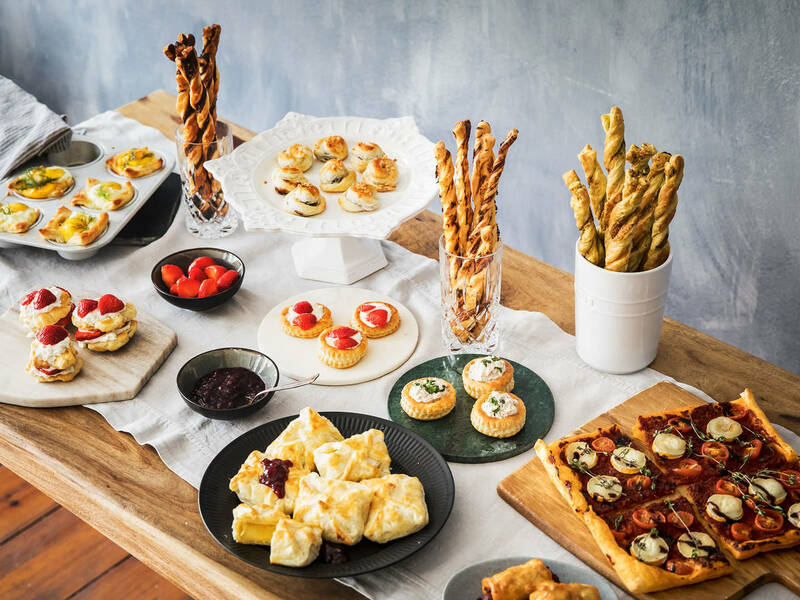 These delicious twists are perfect snacks and a sure winner for any party or casual get-together. You can prepare them with practically any sweet or savory spread, but we highly recommend these 3 combinations: Nutella and chopped hazelnuts, Parmesan cheese and pesto, or cream cheese, Manchego cheese, and smoked paprika powder. Here’s how you make them: Preheat the oven to 220°C/425°F. Roll out or unroll puff pastry and distribute your favorite spread over half the dough. Fold pastry sheet lengthwise, then cut into strips. Holding the strips between your thumb and forefinger, carefully twist them in opposite directions to form a spiral. Transfer the puff pastry twists to a parchment paper-lined baking sheet with, lightly brush with egg wash, and bake for approx. 12 min. or until golden brown. Puff pastry make the perfect base for any kind of tart, just like this one with green asparagus and Gorgonzola cheese. This classic French dessert means "thousand leaves" and is easy to make when using puff pastry. Learn how to make it right here. This hearty steak pie is topped with a layer of puff pastry and it’s a comforting dish we all deserve every once in a while. Have you ever wondered how to make vol-au-vents? The noble looking French classic is actually really easy to recreate at home. All you need is store-bought or homemade puff pastry, cookie cutters in two different sizes, and some egg wash for brushing. Here’s how you make them: Preheat the oven to 220°C/425°F. Roll out or unroll puff pastry and cut out circles using the larger cookie cutter. Transfer half of the circles to a baking sheet with parchment paper. Using the smaller cookie cutter, cut out the center of the remaining circles to create rings. Place them on top of the full circles and lightly brush just the top of the ring with egg wash. Bake for approx. 10 min. or until golden brown. Allow to cool and fill with your preferred filling. We love chicken pot pie filling for a savory vol-au-vent but can’t get enough of sweet vol-au-vents with sweetened whipped cream and fresh strawberries. This quick and easy nut strudel with puff pastry is baked to perfection just in about 35 min. This elegant finger food makes a perfect appetizer for any dinner party and is surprisingly simple to prepare. Here’s how you make them: Preheat oven to 200°C/400°F. Roll out puff pastry and cut it into squares, just a bit bigger then the Brie cheese you’re using. Put one Brie round in the center of a dough square and fold up the corners to meet in the middle, carefully twisting the ends together. Transfer all pastry crusted Brie rounds on a baking sheet with parchment paper, brush with egg wash, and bake for approx. 20 min. or until golden brown. Enjoy immediately with cherry or cranberry jam. Step up your dessert game and make these sweet and delicious tartlets for any occasion. They’re prepared in only 15 min. and are the perfect last-minute sweet treat! Our popular recipe for tarte tatin is extremely simple to make and combines golden puff pastry, juicy quince, and delicious caramel. Another great finger food idea starring puff pastry prepared in no time: Crispy chorizo rolls! Here’s how you make them: Preheat the oven to 200°C/400°F. Remove the skin from 2 – 3 chorizo sausages and carefully squeeze out the meat. Unroll puff pastry and spread sausage meat in a line onto it. Tightly roll up the pastry and cut it into desired sized rolls of equal length. Transfer them onto a parchment paper-lined baking sheet and bake for approx. 20 min. or until golden brown and crispy. Once you’ve tried these homemade cheesecake cups with blackberries, you’ll never look back! If you wish, you can even swap out the blackberries for blueberries, raspberries, or strawberries. Wrapped in puff pastry, this impressive dish with beef tenderloin and wild mushrooms is a crowd-pleaser for any special occasion. A winning summer recipe, you won’t be able to resist these puff pastry stacks with strawberries and heavy cream. Here’s how you make them: Preheat the oven to 220°C/425°F. Roll out or unroll puff pastry and cut out circles, using a cookie cutter. Transfer to a parchment paper-lined baking sheet and bake for approx. 10 min. Allow to cool, then stack two layers as follows: puff pastry circle, heavy cream, strawberries. Enjoy immediately! Quick to make and flexible with flavor combinations, these crisp and flaky French cookies are classics for a reason. Nothing beats the combination of flaky puff pastry, aromatic tomato paste, and creamy goat cheese. These Portuguese custard tarts have a crisp, puff pastry crust and are great to bring to a picnic. Best enjoyed the day they’re made. These savory muffins make a perfect treat for a lazy Sunday brunch. Here’s how you prepare them: Preheat the oven to 200°C/400°F. Roll out or unroll puff pastry and cut into squares. Lightly grease a muffin tin and press puff pastry squares into the tin. Mix 2 – 3 eggs together with some sliced spring onions, chopped parsley, diced bacon, or any other omelette or frittata ingredient you like. Distribute the egg mixture into the pastry-lined muffin tin. Crack a whole egg into each and bake for approx. 25 min., or until eggs are fully cooked. Enjoy! Skip your trip to the French bakery and make these easy chocolate croissants in no time! Fresh out of the oven, nothing compares. A soft, puff pastry base topped with goat cheese and mixed tomatoes—simple and sublime. Would you choose the convenience of store-bought puff pastry over making it yourself? What’s your favorite recipe with puff pastry? Tell us in the comments or send your recipe to community@kitchenstories.com for everybody to enjoy!